Thanks for joining me, APA competition judge Matt Palmer, as I look at the winning Australian Photography Awards Landscape photograph of 2018 as well as looking at what made the rest of the top ten so successful. The landscape category in 2018 had a huge amount of entries and the quality was immense! Just making it to the top 75 meant you were in the top 7.5% of entries, an achievement in itself. Note: An entrant that was in 5th place has been disqualified for rules breaches, and other entries re-ordered accordingly. The top 10 are waiting… let’s get started! 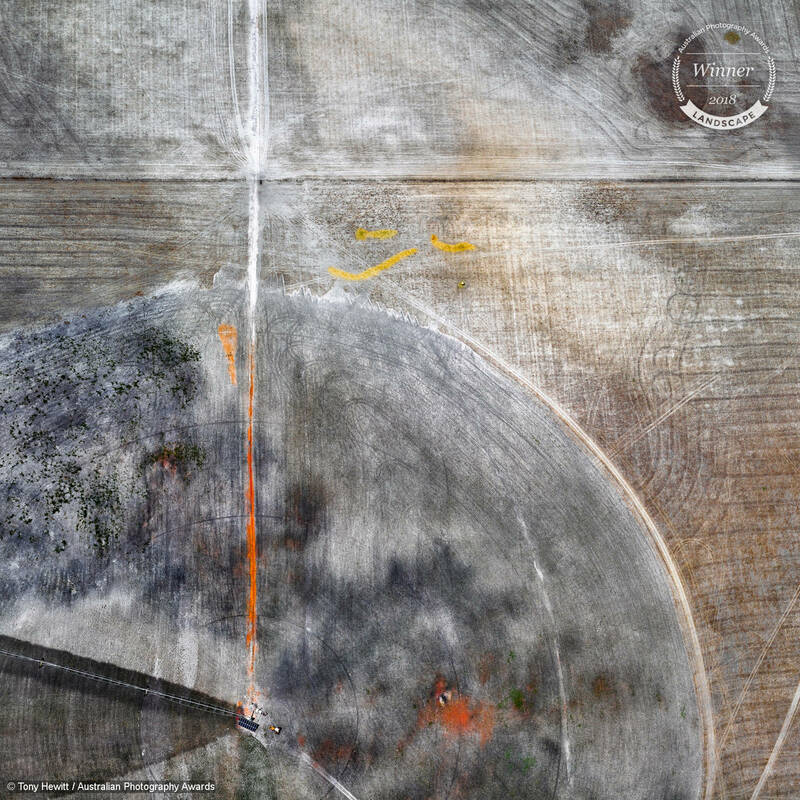 The geometry of farming stands within one of the strongest genres of photography in 2018, aerial landscapes, and takes it to another level of craft. The judges spent a considerable amount of time scouring the details of this photograph and absorbing all the small farming stories that hide within. At first glance it’s easy to miss the beauty of the scene portrayed, with much of the palette being muted greys and browns. Indeed it’s a landscape that is scarred by agriculture, and the texture of the land riddled with the tracks of vehicles and the pronounced circumference of irrigation wheels communicates that well. There are punches of greens, oranges and yellows, some unexplained and some paths, outcrops or perhaps even chemicals that help bring a boldness to the scene, carrying the viewer’s eye from one area to another. In particular the orange vertical line and yellow lines wandering above the central area are key to this scene working. For those that are willing to look there is beauty in these scars. And yet for all the scars there is a story that maybe things will change, have changed. Looking closely amongst the farm equipment by the irrigation it seems the irrigation is now powered by solar. What will this scene look like at the time of next harvest? Tony has created a real masterpiece in this aerial landscape, a feast of composition, of lines, of intention. Everyone involved in the Australian Photography Awards is thrilled to have Tony Hewitts’s ‘The Geometry of Farming’ represent the landscape category as its winner in 2018. Line Up is a beautifully composed and captured rendition of a fairly popular subject matter for landscape photographers in Australia, seaside baths. But Avalon Rock Pool may never have looked this good. Yan uses an exposure time of 0.6 seconds to capture the dynamic movement in the scene, the water rushing rapidly towards his legs, the movement of one of the surfers, and the crashing of waves coming towards shore. It was a clever decision and this shot hinges on it. The composition is very strong with the foreground handrails providing an interesting static construction for the water to crash around, counterbalancing the surfers waiting by the chain link fence whose silhouettes are all captured beautifully and in very legible shapes. In all an iconic Australian landscape that stops me every time I see it. 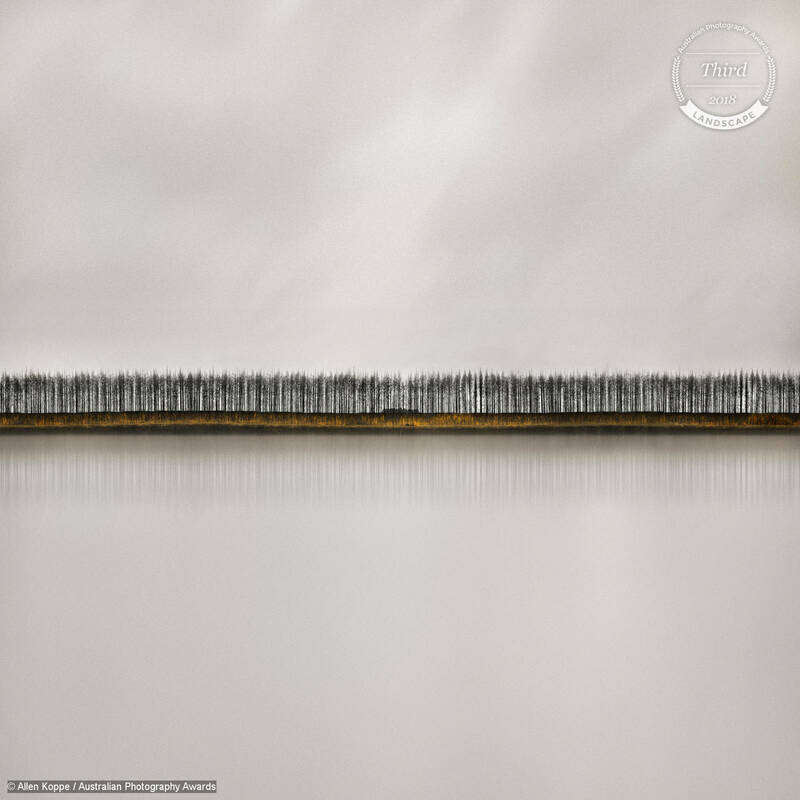 Allen Koppe submitted an extremely strong folio of work across the landscape category, and this simple landscape had the judges talking. 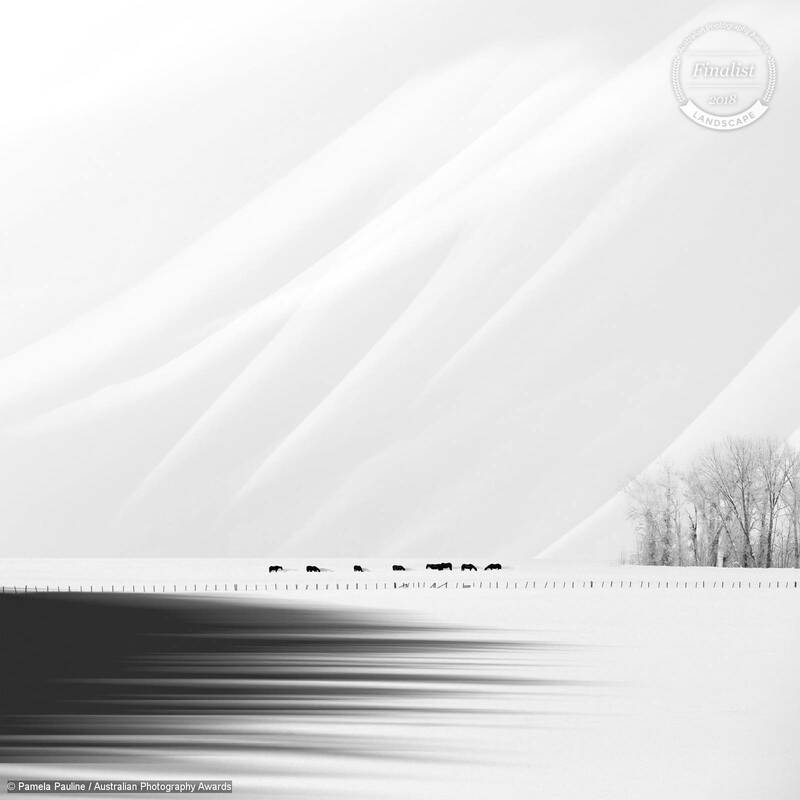 It’s a photograph that evokes a tranquility and atmosphere that stretches beyond its visual simplicity. The tonality both of the river bank and of the sky and water has been treated beautifully, with a gentle grain adding to the feeling and texture. The reflections of the trees on water are my favorite part of the landscape, the denseness forming almost a gentle barcode of nature fading into the nether. Incidental Art is a landscape that smacks you straight in the face and doesn’t let go. The colour palette is all about the rich red that is then carried through the surrounding area by man’s machines. 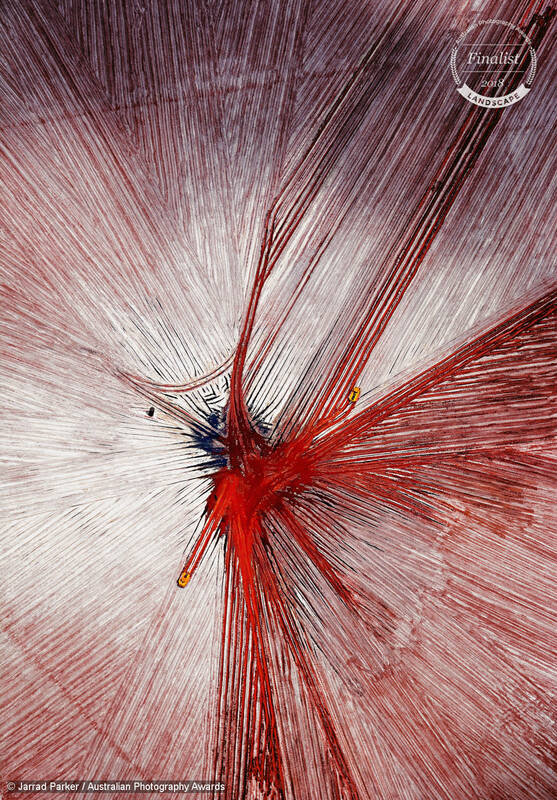 Hundreds of lines move back and forth, back and forth, all leading to the point of impact, forming interesting patterns, triangles and intersects. While exactly what is happening here is never fully revealed we’re led to believe it’s probably not good. Not good at all. But this photograph is fantastic. 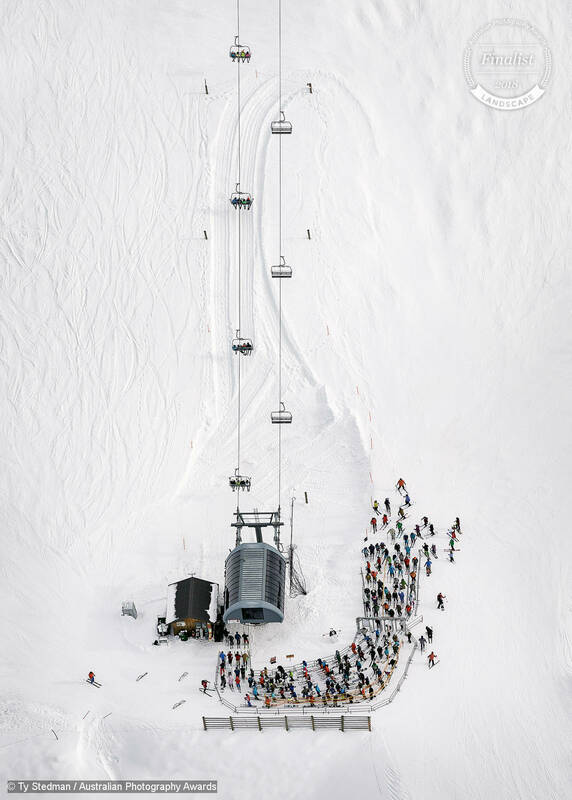 Ty Stedman’s aerial of skiers lining up for a chairlift is packed with detail that has the viewer noticing something new every time the landscape is viewed. Almost like an aerial ant farm, you can observe the snow for the footsteps of people, ski trails, and even vehicles. I particularly enjoy the textures of the fresh ski run on the left juxtapositioned by the fresh snow on ski runs on the right which tells a story about how the slopes are rotated in use. Being able to observe the multi-colour laden people being carried up the slopes is also a fine detail and one that elevates the whole composition. This whole landscape is about movement and transition from one space to another, and yet it will capture your attention and not let go! Federico’s stunning panoramic created plenty of discussion within the judging panel, both for its unique representation of forest, and because as we all wanted to know the technique used! The white trees and foliage are very reminiscent of infrared techniques. However, I suspect Federico has cleverly used a capture with these beautiful red trees amongst green ones, and desaturated all but the channels that highlight the central trees. If that is the case, it’s clever editing, and it’s created an artistic photograph of stunning beauty as a result. The removal of colour also brings out the many lines and textures of what would otherwise be a very visually busy and distracting forest. Even without the red trees as a central focal point, the rest of the composition becomes a beautiful serene landscape that stands on its own. What an amazing landscape Pamela has captured in Northern Wyoming. The trees on the right are the main grounding element to tell you that yes, this is real, and it is a photograph. The horses are captured in varying poses of feeding in this harsh landscape. They stand out immediately. The mountain backdrop behind them is just so velvety and suggests either massive mountains very close by the field, or a telephoto lens cleverly used at distance to compress the scene and ensure these velvety snow-covered slopes fill the frame. As can be seen by the direction of light both hitting the slopes and causing directional shadows from the horses, there must be quite a forest or obstruction casting this interesting shadow into the foreground. This mysterious shadow creates an interesting element, perhaps a foreboding one that creeps into the otherwise high key landscape. Tony presents a wonderfully warm and delicate seascape from above with Rise. Visually there is little to provide a sense of scale, although the slight ripples in water indicate a substantial size as water acts very differently depending on its area. The judges loved the richness of texture and depth of colour of this piece, as well as the simple but effective composition. Tony probably says it best himself, however, with his poetic caption. ‘In the rise of a falling tide, lies the power of a focused sea’. Ty is back, and he presents us with a visual puzzle. 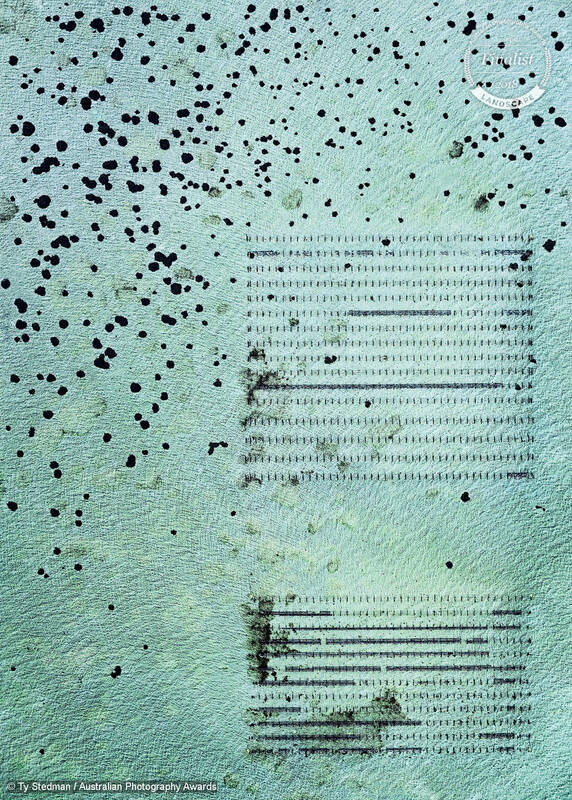 This abstract landscape is beautiful but has roots within reality, the sheet music created in his composition indicative of shellfish farming under the water’s surface. It’s a very clever observation presented artistically and with masses of texture that provide a feeling of movement within the frame. The black ink-like spots present us with another mystery unsolved. Perhaps it’s seaweed or colonies of shellfish that have strayed? Visually these organic marks act as a counter-balance to the rigid lines in the bottom right. I wonder if it’s a mystery I’ll ever solve. 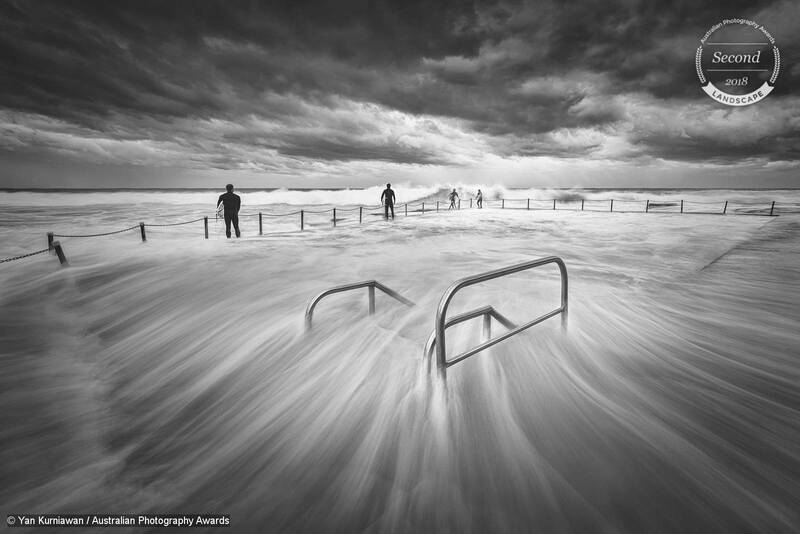 Thank you for joining me as I discuss our Australian Photography Awards Landscape category. 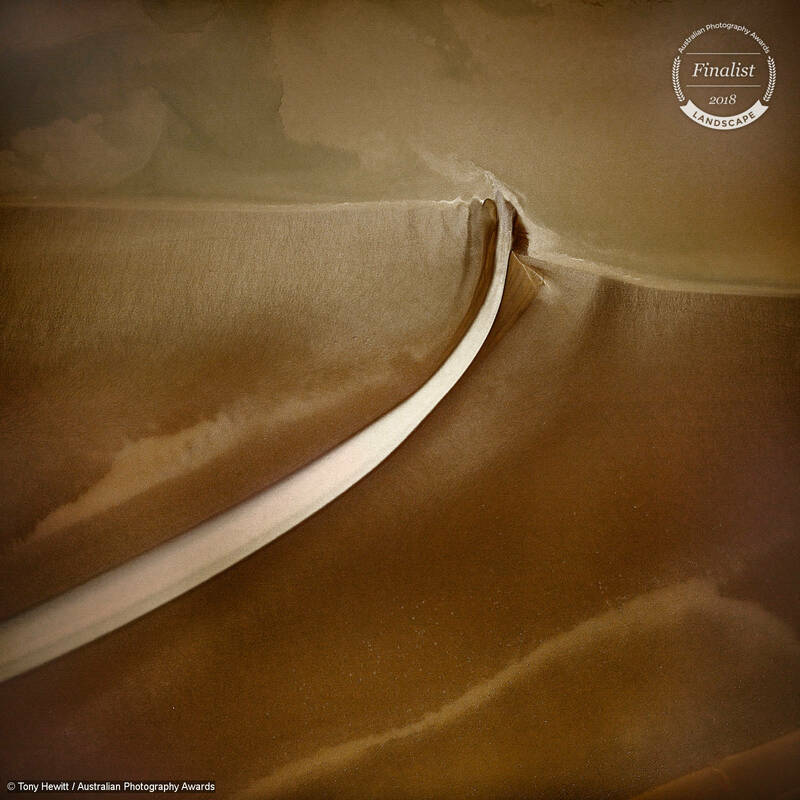 The category attracted monumental support this year and we judged amazing landscape photography using every kind of technique imaginable. Thank you for your entries this year and for making Landscape an extremely hard category to judge with your amazing submissions!